Greetings again from the darkness. 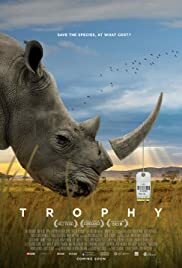 Totally unexpected is a documentary on big game hunting that doesn't come down squarely on one side of this argument. Co-directors Christina Clusiau and Shaul Schwarz do an admirable job of laying out the facts and leaving the viewer to contemplate how these moving pieces create a blurred line between conservation and commerce. Additional segments involve elephants, alligators, and other species. We visit the massive Safari Club hunting convention in Las Vegas, as well as stock auctions where breeders battle over the next generation. The safari clubs argue that much of the money big game hunters pay is distributed back into the conservation efforts of the country, though the corruption of politicians can't be ignored. The contrast between shooters and hunters, killers and sportsmen, is noted and legitimate detailed information is provided. Focus goes to the "Big 5": hunters trying to bag each of water buffalo, leopard, elephant, lion and rhino. The process is slow and expensive, and the three affected tentacles – hunting, breeding, conservation - have evolved to facilitate the future of the species and those dependent on the industries. but reality and self-interest often destroy best intentions.